Hi! 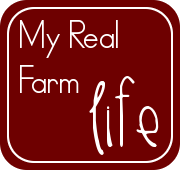 Welcome to day 2 of 31 Days of My Real Farm Life. I'm so glad you stopped by. We started the day by going to church. GrandBoy spent the night so he could go to church with us. He spends every Saturday and Wednesday night here on the farm. GrandBoy stayed in his bed all night by himself! I guess three year olds do that! I got GrandBoy ready to go, then I realized we were already late. Good thing the church is only a mile away! So I went to get dressed. While I was gone, GrandBoy decided to change his shoes, and other things. I got him ready again, and we left. When we got to the church, I took GrandBoy to his class. It is now 20 after ten, and class started at 10. The teacher said, "I see you are late today!" I said, "He's having a bad day today". I guess we will work on getting ready earlier next week, and I guess I will get ready first! So after church, I took home some children who needed a ride. GrandBoy rode home with Daughter #1, so he could spend some time outside with Pappy, before he had to go back to his Mom's house. 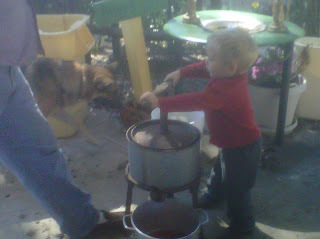 When I got home, he and Pappy were juicing the grapes! GrandBoy couldn't wait to show me that he could do it himself! The juice you see above is for wine. 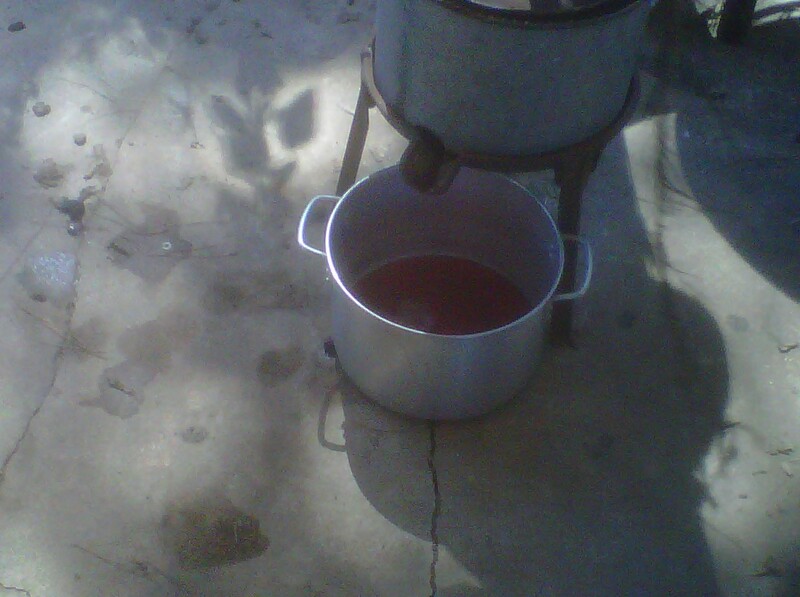 The juice I'm going to can is for grape juice. The grapes that I need are still thawing out from the freezer. So I may not get that part done till tomorrow. I took GrandBoy to meet his Mom, and I picked up some rent while I was out. The rent is slow getting started this month. This is the first one I've collected for October, I believe. When I got home, I got some meat out of the freezer for today and tomorrow. Pappy went to bush hog a pasture we lease for cattle in Tennessee. I'm sorry, but I'm not running up there to take photos today. You'll just have to imagine that part of our farm day. I planned to have pork roast tomorrow fixed in the crock pot. We just picked up a whole hog at the processor last week. We will be busy moving a trailer tomorrow, so that will be good to have dinner made when we get home. Tonight we are having hamburger casserole. I don't know when pappy will be home from bush hogging, so this can wait a while. 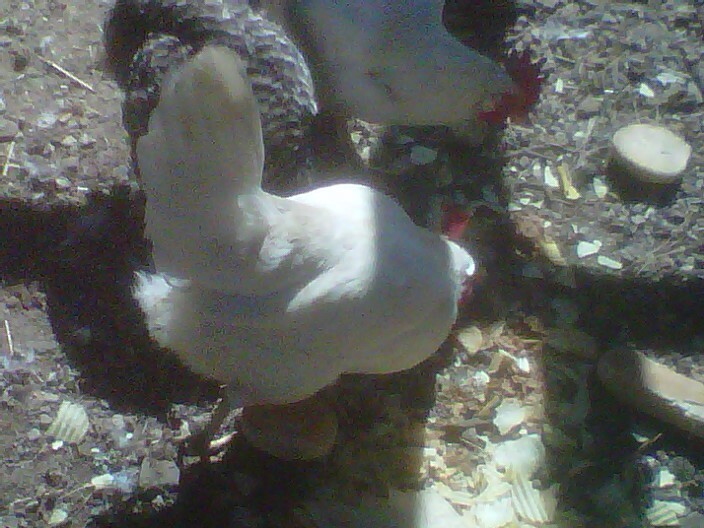 I fed the chickens this afternoon. We give them feed, of course, every day. 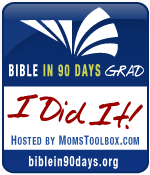 But each Saturday, I try to clean out all the left over bread heals, stale chips, and anything in the fridge that needs to go. I just dump it all in a large pan, then give it to the chickens. Produce can go in there, too. 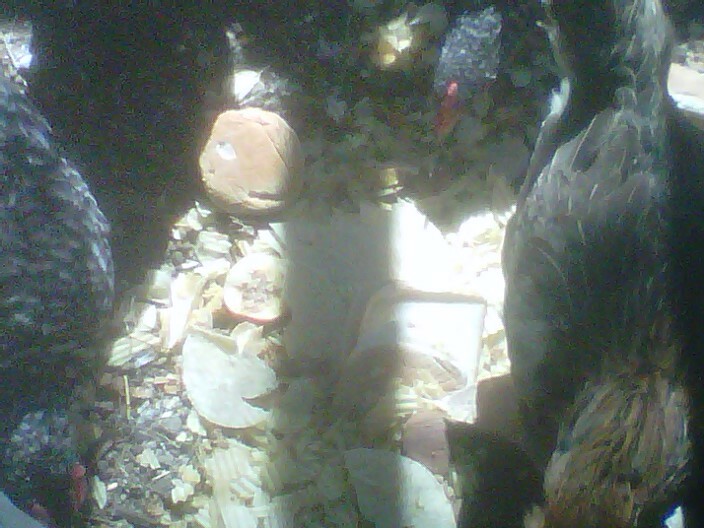 Some people are picky about what they feed their chickens, but I give mine just about anything. So I don't feel so bad if something goes bad, because I'm not going to through it out. Not much goes to waste on the Farm. So now, here I am. I just talked to the trailer moving company, and they will be running late tomorrow. I guess I will wrap up today here, and start planning our wee﻿k. I have to plan my calendar, find out where everyone will be, and get a menu together. On October 1, Pappy was retired one year! So Saturday he is having a "gathering" of police officer friends. Most police officers don't live five years after they retire, so he plans to have a party every year for the first five years! That requires some planning this week as well.